Aspergers Syndrome for Dad: Becoming An Even Better Father To Your Child With Asperger Syndrome by Dan Coulter; Drew Coulter and Dan Coulter (DVD). This video offers practical actions fathers can take to help understand a child with AS. The program includes sections on: taking the offensive, customizing your approach, preparing a game plan, being flexible, being patient, becoming bulletproof and other steps to help find the bright side of AS. 26 minutes. 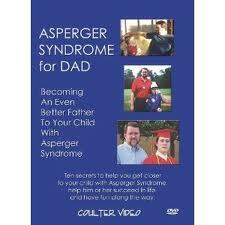 This entry was posted in Family Relationships and tagged Autism Spectrum Disorder, DVD, Family Relationships, fathers. Bookmark the permalink.